Not only in the Netherlands do retailers aim to use videos to show that they know where their product comes from: they are doing the same in Germany. Retailer Rewe went to film at Steiner greenhouse growers. The cultivated area covers 11 hectares. The video has been made for the Pro Planet brand, a brand representing sustainable and regional products at Rewe and Penny. 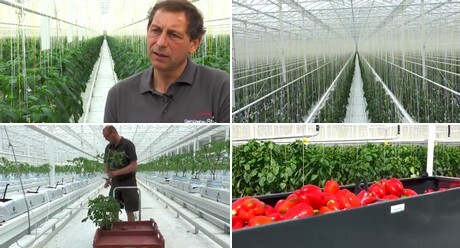 The retailers aim to show that at Steiner greenhouse growers, the tomatoes and peppers are grown sustainably. Rainwater is collected, used for growing, and then recycled. Biology is used as far as possible to protect the crops. But there is more. The crops are heated geothermally, along with residual heat from a nearby biogas plant and with heat from the Kirchweidach municipality. As a result, the crops are grown without using fossil fuels and without producing CO2. Plus, the roof of the shed is fitted with solar panels.